Predictably, I'm behind in my reportage and, predictably, I don't have much time to catch up. But in this one precious hour, I must finally scratch this pesky brain-itch left by the second half of Steven Soderbergh's Che. In the piece I wrote about Che: Argentine, I described the inability of the first half of this epic to stand alone and, in Soderbergh's language, the strong 'response' necessary from Guerrilla to fully answer The Argentine's 'call'. Well, answer it did. For as much as The Argentine is a perfect climb, Guerrilla is a terrifying plummet and, as I had imagined (with the help of Amy Taubin and Steven Soderbergh's words), the two films only make sense when read together. Indeed, they have a perfect inverse relationship, such that adding these films in the straightforward math problem they suggest, leaves one at an impenetrable zero. I have mixed feelings about this. 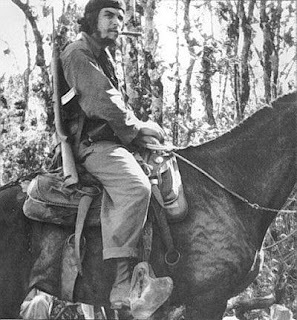 I would have been brought even deeper if our gallant Che of The Argentine had been a bit conflicted about ANYTHING or at least faced a few more obstacles and, similarly, I would have sunk even further under the weight of Guerrilla if Che ever swerved from his march toward death. That being said, the mathematical problem at hand is a fascinating one, producing a symmetry that I'd like to analyze until my brain swells. I want to watch the movies on two screens side by side and then I want to write volumes and then I want to draw it and then paint it. For now, I'll just write some notes. When we left Che in Argentine, he was just settling into victory in Cuba and when we catch up with him in Guerrilla, he's making plans and getting ready to start the fight in Bolivia. The interim we miss is an active one: Castro's regime took some brutal steps to consolidate power and Che was very much a part of this; further, Che tried to export the revolution to the Congo and failed catastrophically. However political or controversial this ellipsis is, the toll of these years shows up in Benicio Del Toro's bedraggled face, in his gait, and in his tired eyes. The Bolivian color pallet is most often gray and bleak compared to the vibrancy of the Cuban and New York settings in Argentine. Guerrilla's camera abandons the artful (semi-distracting) close ups and fragmentation of the New York sequences and the hyper-sleek look of the Cuban battles in favor of hand-held camera whose first language is anxiety. This camera finds details that sum up the journey: a white wet horse in the blue night, Che's beard and hair grown wild, a bloody towel, dried up leaves shaking with the wind. With Alberto Iglesias' score echoing through the mountains, these elements compose a death march on the level of Werner Herzog's haunting Aguirre, Wrath of God (1977). The Andean scenery is only the outer ether of these films' kindred spirits. Both Herzog and Soderbergh's men realize their fate and continue on their march, knowing that the futility of the thing might hit them if they stop. They watch things, minds, and bodies deteriorate as they climb through the mountains and force their minds into strange positions in order to carry on. Herzog's journey eventually moves so internal, goes so mental, that landscape becomes a reflection of the men's insanity. While Soderbergh doesn't go this far--he keeps us witness to the death march instead of putting us right in the center of its psychosis--he does slowly turn his movie into a horror film. This idea about war-film and horror-film is debatable (debate with me!) but there are a few scenes that speak the language of horror quite clearly. Most notably, when a camera follows at a distance behind three soldiers walking up a hill so that, while our three heroes appear oblivious, the audience and the camera seem to know something terrible is coming up the other side of that hill; and also, when a certain line of men assembles (and you'll know it when you see it) causing such terror to descend, such a feeling of being trapped that is exactly the same stuff of the They're-Calling-From-Inside-The-House realization. All of that stuff up there in that paragraph, it builds a color, tone, and noise that's Argentine's opposite, but it doesn't get at the exact kind of symmetry I'm out to describe. Because within this tableau, Soderbergh has taken a fine edged knife to carve out moments and images in Guerrilla that are direct quotations of Argentine, just flipped. Of the most obvious, in Argentine Che makes protestations at allowing a 16 and a 14 year old to fight for the revolution but, met with the same situation in Guerrilla, Che simply states, "At 16, a man already knows what he wants." End of discussion. He gives the same speeches to similarly assembled men, asking them to decide now if they don't have it in them and if they want to leave. In Cuba, this feels inspirational (weeding out the garbage! hurrah hurrah!) and even gets funny. In Bolivia, it feels like a trap, like everyone wants to desert but for some reason they won't...or can't. 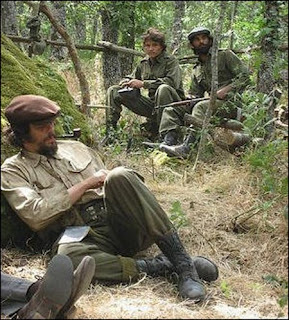 In Cuba, Che's comments about perseverance come off as inspirational while in Bolivia they just seem criminal. The squabbles between Cuban soldiers are set up as jokes for the audience to take a breather from the action but in Bolivia they are fatal. While the Cuban revolutionaries help peasants along the way, giving them food and medical care, the Bolivian peasants get caught in the crossfire and are used and abused by both the Bolivian army and, due to their desperation and disorder, the revolutionaries. The times when Che and his men do help the peasants in Bolivia, we're shown a close-up of a grotesquely infected child's eye whereas the mantra in Cuba seems to be a happy "more meat and less work!". The deaths in Cuba felt somewhat expendable, even if sometimes they made Che very sad, but the deaths in Bolivia feel like portents. Che was constantly pushing his willing and energized Cuban comrades toward education of all sorts, but in Bolivia one man seems to speak for all when he says, "We are too old to learn, when the wheel rolls down hill, let it go." Che's asthma in Cuba was proof of his heroics but in Bolivia it brings us to one of the most startling and tragic moments in the film. Argentine marks time only when switching between periods, but in Guerrilla, we watch the days tick by--at day 340, I found my jaw quite literally dropped. I should stop. But you get the idea. The call of the Argentine is answered in Guerrilla. They belong only together. I have yet to navigate my affection for these films. Are they great? But until I have another 4 hours to spare, Che will stick with me as a formally and structurally entertaining film. I will also probably continue to wish Benicio Del Toro would walk through the door and look in my eyes and say, "What makes a revolutionary?...Love. Love."